- Buy one of the following ebooks! If you are interested in getting more information regarding the advantages of Tarot card reading, then read on. In this article, we will deal with the actual meaning of tarot, its origin and use, as well as how it can be correctly read and interpreted. As a result of the tarot card reading you should be able to evaluate its benefits for you. The tarot cards contain a total of 78 cards in all. Each of these cards contains a picture that may be interpreted by the readers in varied ways. The reader shuffles the cards and a particular number of cards are drawn by the seeker depending on the layout of the cards. Each card separately has the ability to convey an entire story. However, when coupled together, they give an insight into the solution of the seeker's problems or queries, or display the right course of action to be taken. The tarot originated in the 15th century as playthings meant for Italian upper class people. It underwent a series of improvement and alterations and the pictures contained in them today are a later addition. These pictures give a lot better and a much more in depth interpretation to its readers. The number of cards in the beginning was lesser as compared to now. Tarot cards can help you find answers to your problems when you feel at a loss about the actions that you need to take; or you can find out why you are stuck in a particular situation. Tarot reading can help you discover an action or can help you device a plan that will help solve your problem. However, always remember that it is only you who needs to take the action. The tarot can only give you an idea or a plan. Tarot can be beneficial in providing insights regarding your future, present as well as past with a hope that you will be able to figure out the ways to improve your situations. There are a large number of tarot cards, precisely 78 in number. The easiest and the best way to learn their meanings is not by memorizing what each card means. On the contrary, it is better to understand that the deck of tarot cards can be divided into two divisions, namely the major and minor arcane. Understanding this basic concept will help you read tarot cards more efficiently. There are 22 major arcane cards which stand for the things which are out of the seeker's control. These cards includes cards such as the fool, emperor, empress, high priestess, magician, hierophant, chariot, lovers, hermit, strength, justice, wheel, death, temperature, hanged man, tower, devil, sun, moon, star, world and judgment. If you take tarot card readings seriously, you should be prepared to go through countless interpretation levels in this major arcane. On the other hand, the 22 minor arcane hands represent simpler components of life. The four suits of Cups, Wands, Pentacles and Swords symbolize different approaches to life. The Cups are associated with water element and represent female psyche that is coupled with emotions and spirituality, whereas the wands represent masculinity and is associated with fire. Swords stand for thought, reason and intellect whereas the pentacles stand for earth or the material things. The 16 cards of the minor arcane include aces, suits, tens, nines, eights, sevens, sixes, fives, fours, threes, twos, ones, pages, court cards, queens, kings and knights. Many psychic readers make use of tarot cards as the base of their psychic readings and also to validate their psychic predictions. The position of the tarot cards when mixed with the traditional psychic insights are used to get precise answers to the questions of the seeker. Most people prefer to take their psychic tarot reading face to face. However, tarot card psychic readings can also be carried out through email, online chat rooms as well as over telephone. All these means of psychic readings are acceptable and legitimate. The most common information that a psychic requires from a seeker are his full name and his date of birth. Some psychics even ask for a photograph of the seeker or a sample of his or her handwriting so that he can connect to the 'aura' or personal energy of the seeker. When the seeker and the psychic tarot reader reach an agreement and seriously indulge in receiving psychic readings, the gates of a huge storehouse of information opens up. The tarot cards are used to focus on important bits of information about the past, present as well as future life of the seeker which can be helpful in finding out what influences affect his or her life. Tarot cards simply serve as tools that can be combined with the natural ability of the psychic for increasing or supporting the calculations of the psychic. Since psychic tarot reading gives a clear image of what the future looks like, the seeker gets the opportunity to alter his future by bringing about a change in his thoughts and deeds. Psychic readings will not give you any conspicuous result. However, it can reveal the current path of the seeker and by altering this path, the seeker can adjust his future. How can Psychic Tarot Reading benefit you? Most people believe that Tarot reading, often referred to as fortune telling, is used for getting guidance regarding situations or events that may take place in the future. However, this is not the only benefit that one receives from a psychic tarot card reading. The person taking a psychic tarot reading can also ask different questions about their present or past, which would help them understand the reasons behind their present situation or about the events that took place in their past life. With the help of psychic tarot readings, it is possible to get an in-depth look into your way of thinking and your actions which are going to benefit you in the long run, particularly when it comes to relationships. It also assists those who are trying to cultivate any philosophy on life or spirituality. The tarot cards are not some simple isolated cards which are unconnected to each other, but they actually represent the journey of a spirit's life, where it learns and understand various things through this journey. Thus, taking a tarot reading through phone, chat or in person can help in understanding the pattern of life and the right way to deal with astonishing situations. Another benefit of the psychic tarot reading is that it can be used for the purpose of counseling if you are in a situation of despair. The psychic tarot reading would help to ease one's mind. In conditions of anguish and dejection, our conscious mind prevents us from accessing the deeper layers. The tarot cards can help us in realizing these interwoven facts. The tarot cards are the representation of life's development and are used to gain insight into the ways our minds respond in a particular situation. Tarot can even help little kids in expressing themselves better. These are some of the benefits that can be derived with the help of psychic tarot readings. Most of the people at the beginning focus on the future. However, with time and with more tarot readings, one will begin to look into other ways in which psychic tarot readings can help him/her. Once you realize the power of tarot readings, you can use it to derive various benefits such as bringing out the best in you. Meditating on the favorable situations indicated in the reading is also a good strategy. This helps in gaining self assertion when you face difficult times or when things don't work in your favor. Psychic tarot readings aren't considered as something weird anymore. In fact, they are a safe and fun way to get insight into your past, present and future. Not just that, they are also practical. Is Tarot Card Reading Same as Psychic Reading? There are a lot of differences between a psychic tarot card and a regular Tarot card reading which may not be understood by common people. How efficient is a person in using the tarot card in predicting one's future or using tarot card for divination? All this makes an immense difference. For a novice tarot card reader, the exact meaning of the tarot card makes more difference in comparison to the intuition regarding them. To become an expert tarot card reader one must learn to enhance their skills of intuition. The tarot card reader must have potential to foresee the future of another person using a tarot card as a medium. 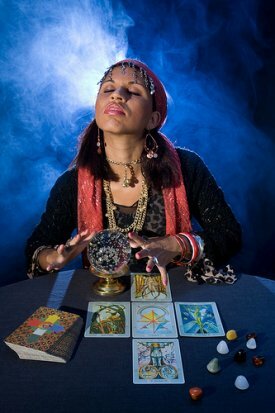 A psychic tarot card reader must possess an insight to make an accurate prediction and this can only be possible when a tarot card reader develops his intuitive skills. If his insight is beneficial to others only then can he become a successful reader. Tarot cards are considered as the symbols that represent the various experiences of life. Once you apply the spiritual principles represented by the tarot cards in order to receive the accurate information, the psychic tarot reading will be that in which a reader will make use of his or her gifted spiritual powers along with tarot cards to reveal the hidden meaning. Which is more accurate - Automated Tarot Card Reading Online or Psychic Tarot Reading? Tarot card reading can often be quite mysterious. In the case of an automated tarot card reading, it is undoubtedly true that no computer can even have the ability to convey divine or spiritual information correctly. Online Automated tarot reading, however, has certain conveniences. There is no need to book an appointment, and your results will be delivered to you instantly. Besides this, the cards are also chosen randomly which give you a nice mix of interpretations and spreads. Though it is fun to make use of these readings, no psychic ability or intuition is involved in this. However, they can be useful in deriving the meaning of various Tarot cards. This can sometimes give you some encouragement regarding the problems that you might be facing. Thus, they prove to be quite entertaining as well as fascinating. Tapping your own intuition moved by these tarot cards can also be a good thing. However, these readings stand nowhere in comparison to the skills and talent of the authentic psychic readers who can amaze you with the actual psychic tarot card reading.